Tuna and hard cooked eggs are such a complementary match in sandwiches and salads, it's a no-brainer to team them up in these deviled eggs. 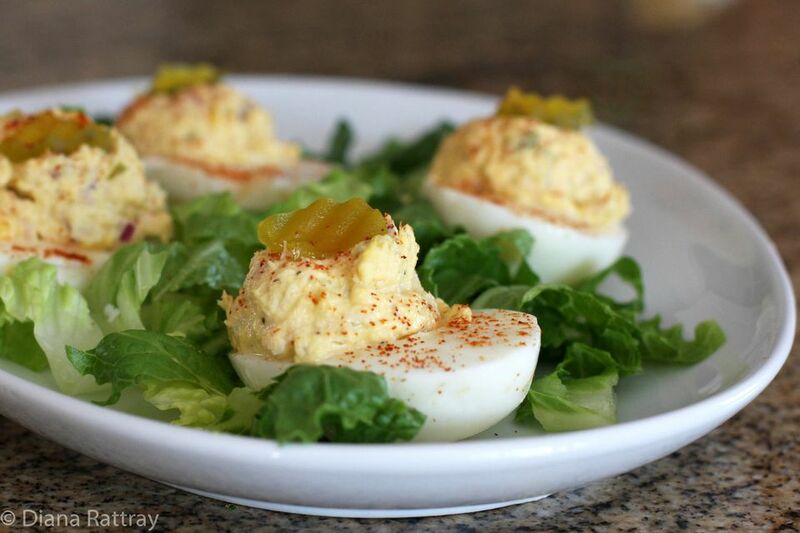 The deviled eggs with tuna in the filling make a fabulous snack or picnic treat. Celery, red onion, and dill pickle add extra flavor and crunch to these eggs. Top them off with a piece of dill pickle or a slice of pimiento-filled olive. Place the eggs in a deep saucepan and cover with water up to at least an inch above the eggs. Cover the pan and bring the water to a full boil over high heat. Remove the pan (keep it covered) from the heat and let stand for 17 minutes. Drain the eggs then add cold water to the saucepan. When the eggs have cooled completely, peel them under running water. Slice the eggs in half lengthwise and set them on an egg plate or platter.To keep the white halves from rolling on a plate, slice a tiny piece off of the bottoms to give them a flat area. Or, line the platter with shredded lettuce, kale, or other greens. Scoop the yolks out into a medium bowl. With a fork mash the yolks. Add the drained tuna, 5 tablespoons of mayonnaise, chopped pickle and pickle juice, onion, celery, and ground mustard. If desired, add more mayonnaise. Taste and add salt and pepper, as needed. Using a tablespoon or small scoop, fill the egg halves with the tuna and egg yolk mixture. Sprinkle the eggs lightly with paprika and top with a slice of dill pickle, olive, or a pimiento strip. Fresh eggs are harder to peel. For boiled eggs, wait about a week before cooking and peeling. Chill the eggs before cracking the shells. To crackle the shells, roll them in your hands while applying light pressure. If you roll them on the counter, be gentle. Start peeling at the wide end of an egg where there is a bit of air under the shell. Store hard-cooked eggs in the refrigerator for up to 1 week. Store them peeled or unpeeled in a covered container. Going from the refrigerator into cold water can shock the egg, and it may crack in hot water. To avoid cracking during cooking, soak eggs in warm water before you begin to cook them.